Our friends Marshall and Carolyn Moss moved from Virginia to Tucson around 1980 or so. We've been to visit them several times and once we even "borrowed" their house and car while they were out of town. At that time Tucson was the home of Al Marah Arabians, which was my big draw -- in addition to seeing Marshall & Carolyn, of course. In 1988, however, Al Marah wasn't yet on my radar, so we just went to visit the Mosses. I don't know why I didn't get any pictures of them. 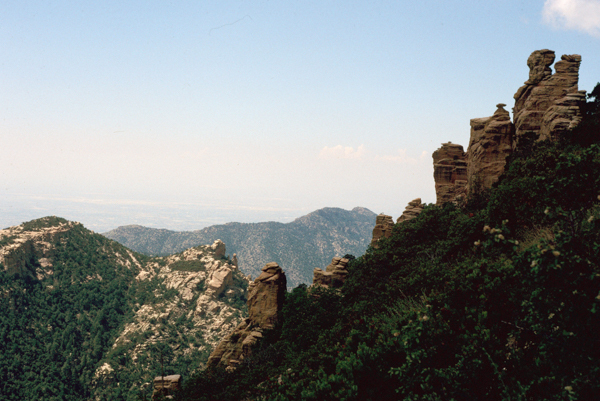 We found it hard to believe, but not far from Tucson in the high desert is a ski area: Mt. Lemmon Ski Valley. Even though we were not visiting in the winter, we had to check it out. Mt. 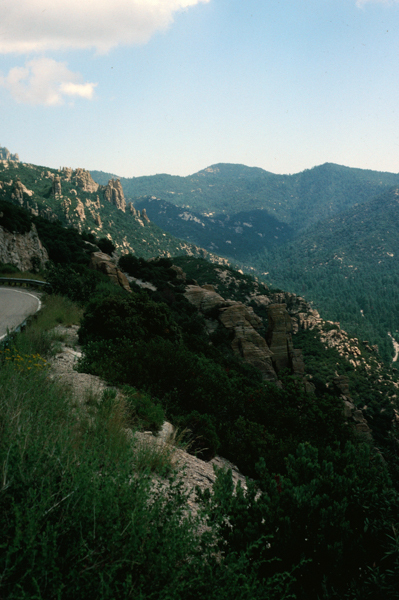 Lemmon itself is the highest peak in the Santa Catalina mountains at over 9000'. These mountains are to the north of Tucson. The road up the mountain is pretty spectacular. The rocks have been fractured and sculpted into a variety of fantastic shapes. 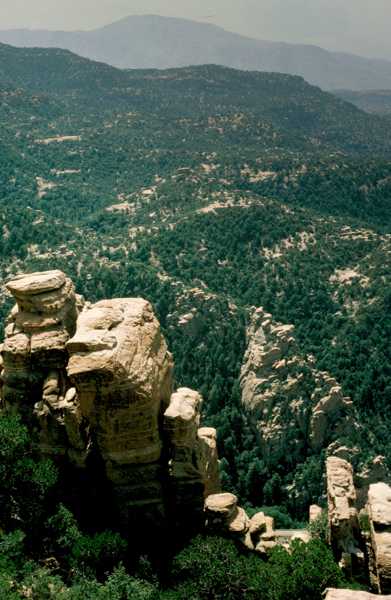 The Tanque Verde Mountains, located east of Tucson, as viewed from the Mt. Lemmon road. 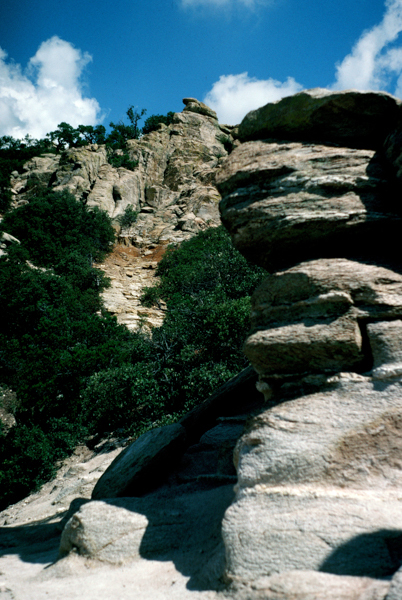 The wind-sculpted rock pinnacles are called hoodoos. 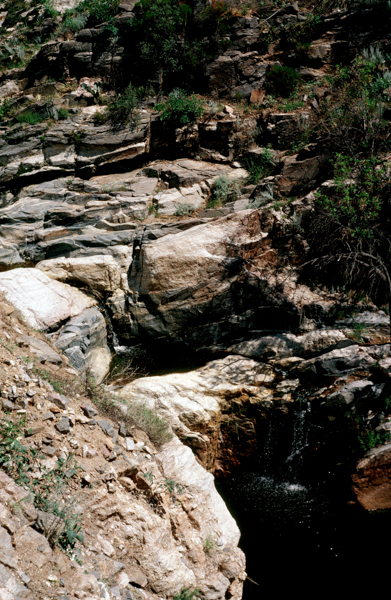 There are numerous springs in the mountains and they eventually add up to this creek that parallels the Mt. Lemmon road. 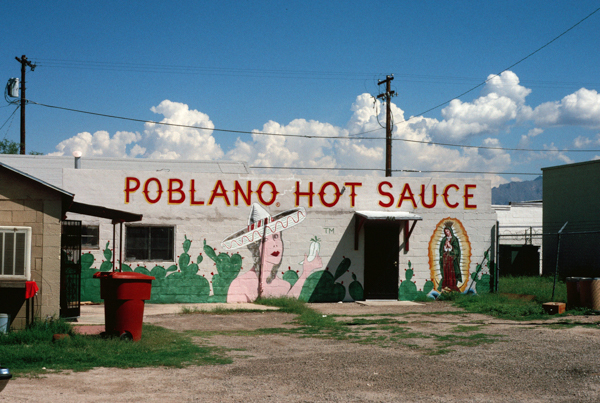 Many years earlier Marshall had introduced us to Poblano Hot Sauce. It was very hard to get. For a while we ordered it from the factory, but we had to get a minimum amount and it didn't get used quickly enough, so we gave up. While in Tucson, however, we had to visit the factory. South of Tucson is the Mission San Xavier del Bac. The mission was founded in 1692 and the current building was completed in 1797. I bought a beautiful Papago basket there (although apparently that term is no longer used). We still enjoy it regularly. I love doors and I thought this was a lovely one. 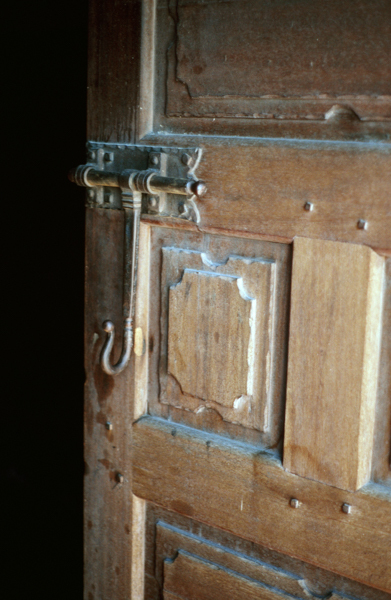 The latch is particularly beautiful. I found a recent (April, 2016) article that the mission had been heavily vandalized with spray painted graffiti. 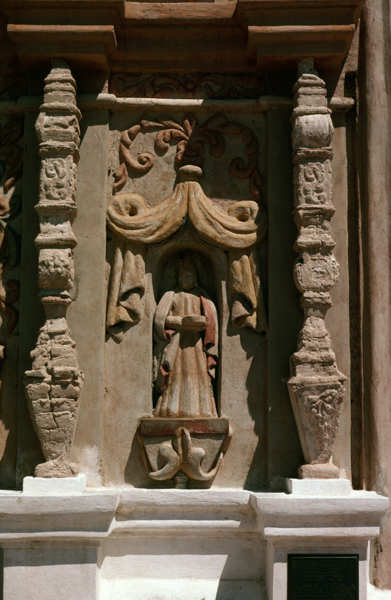 These exterior carvings were at least spared.The last time we went to Tucson (1999) I came home with a horse, so Jim hasn't encouraged me to go back in recent years. Maybe now that Al Marah has moved to Florida it would be safe to return! This cactus was in full bloom at the time of our visit. 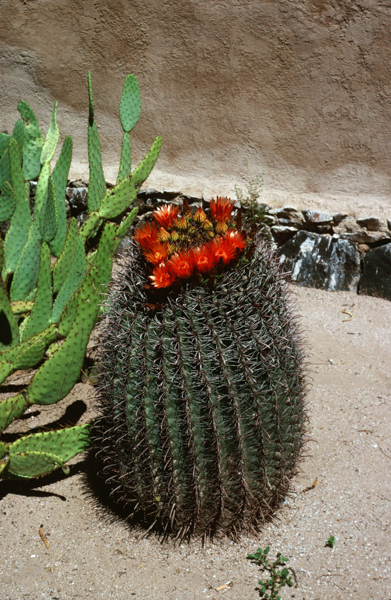 It is a barrel cactus, probably Ferocactus wislizeni. Click for more plant pictures from the Sonora Desert Museum.